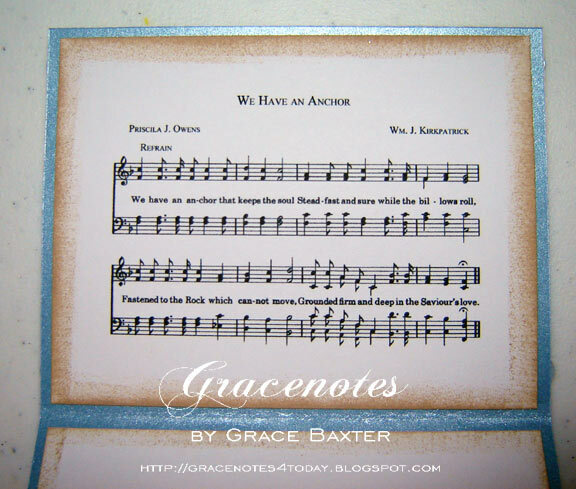 I woke up the other day with an old hymn running through my head, "We Have an Anchor". It's one we rarely hear anymore. The design for this card totally came from the inspiration of the hymn. You know you're really into card making when you wake up with entire designs in your head. 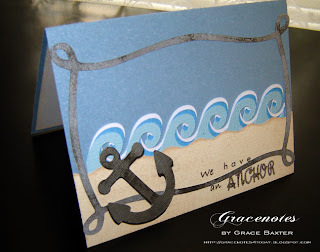 I'm so glad there is a beautiful anchor on the Life Is A Beach Cricut cartridge. The billowing waves are from the same cart and I layered them in three colours. White caps have to be white, of course. 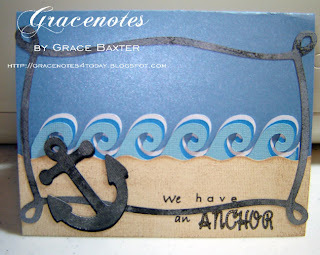 I created the sentiment on my computer, after finding just the right "rope" font for the word "anchor". My card stock was 8-1/2x11 so it was easy to print off several in Word using a label layout. For the sandy beach, I cut the cream card stock using the wave blade on my cutter... just for the top edge. I sponged on some sand using "Dune" from the Color Box. It really looks like sand! I didn't have a rope that worked so I hunted through my carts for something similar. The frame I chose is on Stretch Your Imagination. I like how it bends and curves around. With a little antiquing in black, the rope frame looks like it belongs with the anchor. 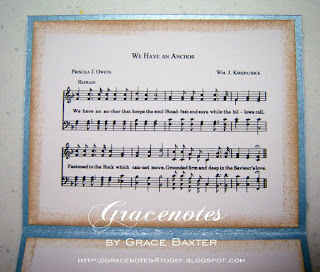 To create the music excerpt, I scanned just a portion of the music right out of a hymnal. It's public domain and is so old, no copyright is violated. The scanned image looked grayish when printed so I had to spend some time fixing it in PhotoShop. And when I say I spent some time... I mean a LOT of time. I now have something usable for future cards. And I also learned a short-cut in PS. Trial and error, right? But the anchor... how sweet is that? I can't resist giving you another view of it. I cut it once from gray (sponged with black and silver) and once from black to offset as a shadow. 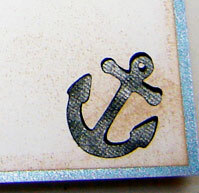 The anchor on the front is 2 inches and the small one inside is 1-1/4 inches. I nearly forgot to tell you... the base card is a pearlescent that shimmers just like the water does when the sun shines on it. Too corny? I love it! I will be using this card as a thank-you but it could be used for anything you'd like. By the way, if you ever find yourself feeling down, dejected or lonely and you don't know what to read to pick yourself up, thumb through the pages of a hymn book and just read some of the lyrics of those old hymns. Your faith will be renewed and your spirit lifted in no time! I'm so glad we have a sturdy Anchor to rely on when life hits hard. Thank you for your card. I am checking out the Life is a Beach cart and found your cards and blog. 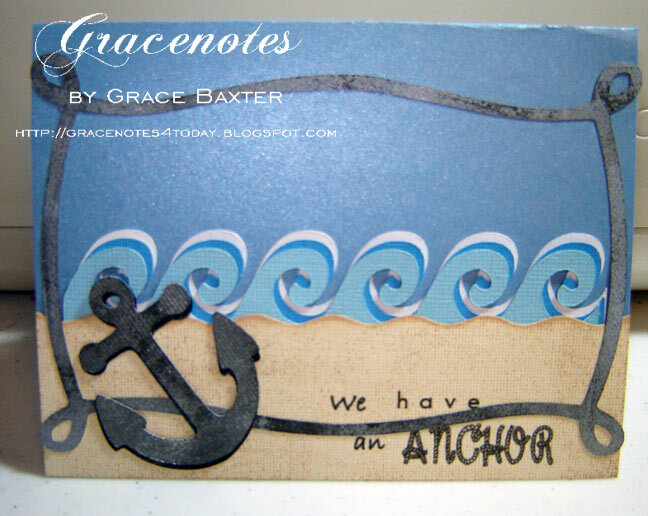 I LOVE your anchor cards and I appreciate your directions. I wondered where you found the hymn music and now I know! Great idea! I also love to have the words of great hymns run through my mind - I can sing pretty good there, LOL. 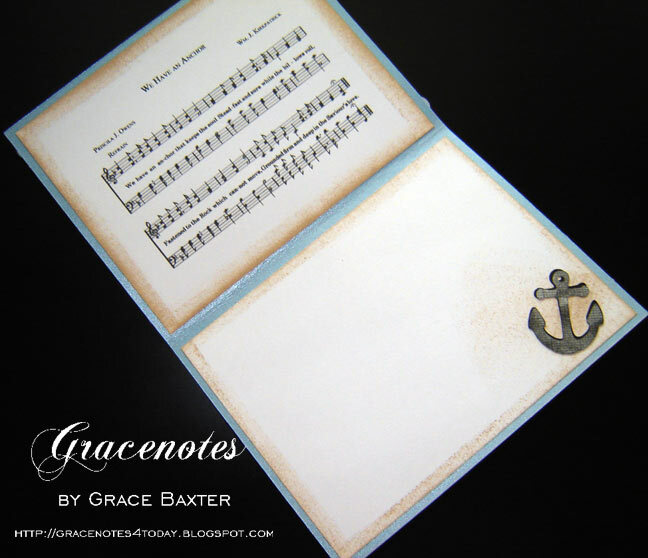 And there are some really wonderful stories behind some hymns and that makes them even more special.